A macaron is a sweet meringue-based French confectionery. It is crisp on the outside and chewy on the inside. This is the basic macaron recipe with the basic buttercream filling ;) You can customize with any color and flavor. 1. 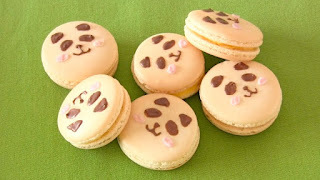 To draw panda face, you want to make large macarons. So, draw about an inch and a half wide circles (leaving about 2 inches between) on a piece of paper. To make perfect uniform circles, you wanted to place it under the parchment paper to trace. You can search for the template online. 2. Measure the egg whites in a large bowl, and keep in the fridge (to make them easier to whip). Sift in ground almonds and powdered sugar in a large bowl, then keep in the fridge (to let them stay dry). 3. Meringue: Whip egg whites with an electric mixer until foamy. Gradually add granulated sugar 1/3 at a time, then continue to whip until stiff glossy peaks form when you lift the beaters. 4. Add the meringue into the dry ingredients, and mix with a silicone spatula until just incorporated. 5. Macaronnage: Punch down the spatula into the batter, then scrape batter from the sides to the center, and punch again. Repeat this for 10 or more times (depending on your arm strength) until the batter slowly and continuously drips back into the bowl like a ribbon when you scoop it up with the spatula. 6. Line baking sheets with parchment paper, place the template under the parchment paper. Fit a pastry bag with a 3/8-inch round tip, and fill with batter. Pipe out the batter in the circles (the batter will spread a little, so keep it smaller). Tap bottom of each baking sheet (or slam on the counter) to release any air bubbles in macarons. 7. Let stand at room temperature until dry, and a skin forms on the tops,　for about 30 minutes or more. Make sure the batter will not stick to your finger. 8. Preheat the oven to 150C (302F). Bake for 14-15 minutes. Let the macarons cool completely on the baking sheet. 1. Beat the egg yolks and sugar until they turn a lemon-yellow color and thick. 2. Add the butter and mix well. Then add vanilla extract to taste. 3. Pour the buttercream into a pastry bag. 1. Pipe about 1 teaspoon buttercream on to the middle of one shell, then gently place another shell on top. 2. Set the chocolate pens in a cup of hot water for a few minutes. Cut the tip of the chocolate pens and draw panda faces on the macarons. Rest the filled macarons for a day before eating them. You can store them in an airtight container in the fridge for up to 3 days.